I think Valentine’s Day is a bit overdone here in the U.S. If you pay attention to the ads, they suggest every man should buy his wife or girlfriend a relatively pricey piece of jewelry to celebrate the day. Not only do I fear the idea of my husband having to personally select that much jewelry for me, (because if I’m going to own that much jewelry, I’d rather select my own pieces), but it also puts a ridiculous amount of unreasonable pressure on our nation’s menfolk! As an American, I’ve accepted that every possible holiday or occasion is commercialized to the full extent possible, and then some. And although my husband and I try to make holidays fun and magical for our children, we try to reject a lot of the commercialization and focus on the true intent of the holiday. Valentine’s Day doesn’t require a fancy gift or expensive dinner. It’s a day to recognize and celebrate love. Giving a card (especially a handmade or carefully selected card!) to a loved one is always special. After all, who doesn’t like to be reminded they’re being thought of? It can also be nice to share a sweet or special indulgence. Forget all the commercial candy currently stocked in stores. Nearly all is chock full of chemicals, the dreaded high-fructose corn syrup and artificial coloring. And if you can carve out an hour between now and next Friday, consider making or baking a little treat for your loved one(s). Your efforts will be greatly appreciated! 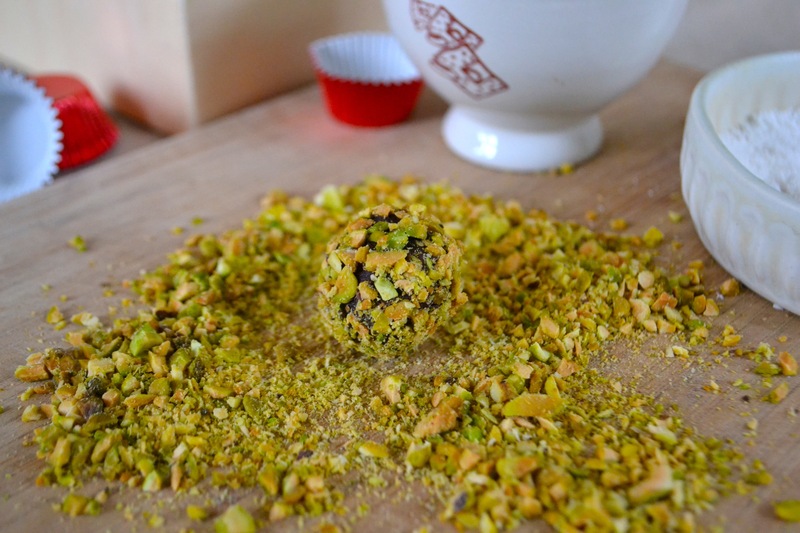 Other toppings: finely chopped pistachios, hazelnuts or pecans, toasted unsweetened shredded coconut, etc. * My favorite is Green & Blacks Organic Chocolate bars. They’re available in the U.S. and U.K. and probably a few other places by now. They are remarkably smooth with excellent flavor and no bitterness, even at the 85% cocoa level. 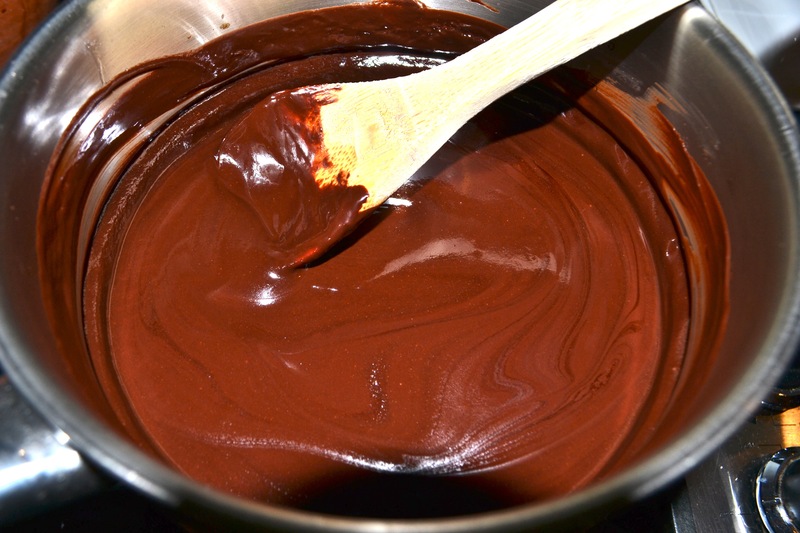 Heat chocolate, oil and 3 tbsp water in a double boiler, stirring until just melted. Remove from heat, add in vanilla and sea salt, and mix well. Transfer mixture to an 8-inch baking dish or glass loaf pan, and refrigerate until the mixture is firm but still pliable, about 2 hours. Using a 1-inch melon baller or very round spoon, scoop out the chocolate mixture and transfer to a parchment-lined baking sheet. 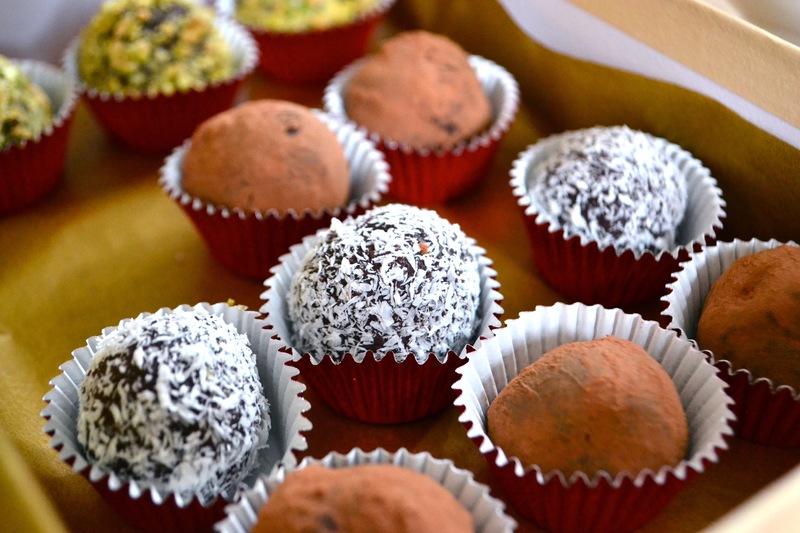 Coat your hands with cocoa powder and roll the chocolate scoops into balls. For the other coatings, roll the balls in the finely-chopped nuts or coconut until evenly coated. Refrigerate 10 minutes to set. 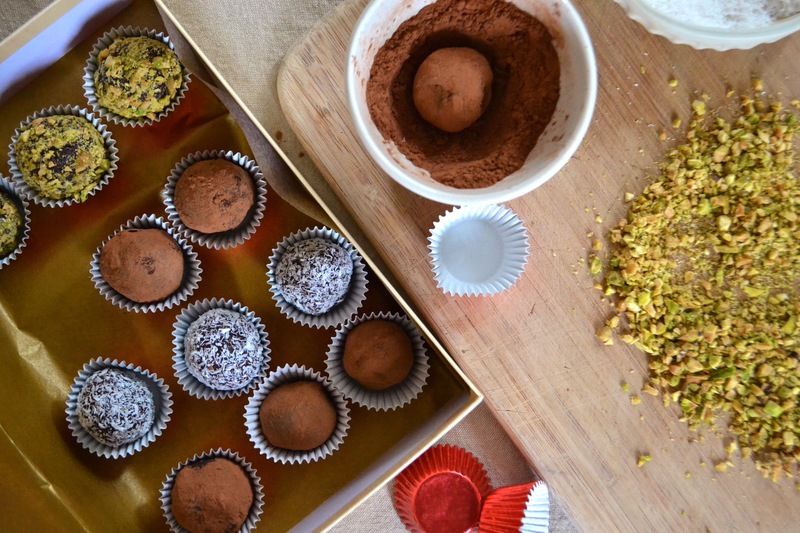 Place the truffles in small gift boxes or tins lined with parchment paper or colored tissue paper.